Buy From Dum Beauty Now! Best Service! This lip liner is a dream come true! Glides on your lips with ease, going on effortlessly. The colors are highly pigmented!!! They vary from dark browns, deep purples, bright reds, matte nudes, to hot pinks, as a result, they become our favorite lip liners! These are also full size and longer than typical liners. The quality of the color is excellent, very creamy and easy to apply and sharpen. Its main ingredients are carnauba wax, bees wax, ceresin, cocoa and shea butters, octyldodecanol, isopropyl myristate, diethyl hexyl cyclohexane, butylparaben, and BHT. Please note the new lip pencil design, designs will be mixed, same quality, same size 0.08oz. Refer to images of new look! 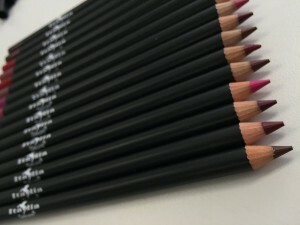 Best Seller In Lip Liners!